Baruch Samuel Blumberg was born on July 28, 1925 in Brooklyn, New York. His father, Meyer Blumberg, was a lawyer. Blumberg attended Yeshivah of Flatbush a parochial elementary school where he learned to read and write Hebrew. He attended Far Rockaway High School. In 1943 he joined the U.S. Navy where he served as a deck officer on landing ships, completing a undergraduate physics degree while he was in the Navy. He retired from the Navy in 1946. After leaving the Navy he began graduate work in mathematics at Columbia University. After a year studying math, he switched to medicine, at the urging of his father. he earned his MD in 1953 and remained at Columbia for his internship and residency working at Bellevue Hospital . He then went to Balliol College, Cambridge where he studied biochemistry, earning a PhD in 1957. He was the first American to become a master of Balliol College. From 1957 to 1964 he worked for the National Institutes of Health. Blumberg's research dealt with polymorphisms in serum proteins of human blood. Polymorphisms are differences in proteins caused by different gene alleles. Alleles are different forms of the same gene. He took many trips to tropical countries to collect and study the blood proteins of people living there and studied how these differences affected the health of the their carriers. During his trips to Australia he found a unique protein in the blood of Australian aboriginal people, which he called Au. In 1966 he found a patient who had the Au protein spontaneously appear in their blood. The same patient developed hepatitis. From this result Blumberg determined that the Au protein was a surface protein for the hepatitis B virus. Using this result Blumberg and his team were able to develop a screening test and a vaccine for the Hepatitis B virus. For his discovery of the hepatitis B virus Blumberg shared the 1976 Nobel Prize in medicine with D. Carleton Gajdusek. After winning the Nobel Prize Blumberg continued working to better understand the hepatitis B virus, including its affects on individuals carrying the virus. 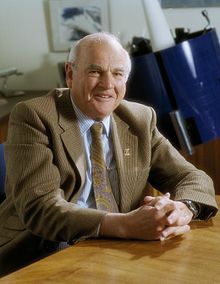 In 1994 Blumberg was elected fellow of the American Academy of Arts and Sciences and he served from 1999 to 2002 as the first director of the NASA Astrobiology Institute. Blumberg died of an apparent heart attack on April 5, 2011, while he was attending a conference at NASA's Ames Research Center in Mountain View, California.